Why is a new strategic plan needed now? The timing is right for many reasons. Here are a few. 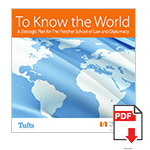 First, Tufts University as a whole is undergoing a period of renewal, recently completing the T10 Strategic Plan. Second, Fletcher went through a leadership transition in 2013, with Dean James Stavridis taking the reins at the school. Third, new areas of knowledge are becoming increasingly important to professionals working in the field of international affairs. Fourth, changes are taking place in the field of higher education, including those driven by technology. Fifth, the job market remains weak after the 2008 crisis, and students’ concern about post-Fletcher employment is more pronounced. The strategic planning process will give the Fletcher community an opportunity to consider the best ways for Fletcher to pursue its mission in light of these and other contextual changes. Who led the strategic planning initiative? The Steering Committee, chaired by Dean Stavridis, played a lead role in guiding the efforts of various Working Groups and subcommittees and in formulating the content of the strategic plan. The Steering Committee represents a broad cross section of the Fletcher community with representation from the faculty, the Fletcher Board, alumni, students and administrators. In one way or another, all members of the Fletcher community were asked to participate and to bring an open-minded perspective to the work of identifying challenges, opportunities and resources that helped shape the strategic plan. To focus the analysis and consideration of opportunities, we established Working Groups. These Working Groups consisted of faculty, administrators, students and Fletcher alumni. Faculty, alumni, administrators and students on the Working Groups were drawn from a wide variety of backgrounds and perspectives. We invited all members of the Fletcher community to participate in town hall meetings and to contact members of the Working Groups or Steering Committee with suggestions. The members of the Working Groups were listed on this website. There were 10 working groups at the beginning of the strategic planning process. Then there were six. Why the change? In the first phase of the strategic planning process, 10 issue-specific working groups were tasked with assessing the current state of The Fletcher School. As the planning effort transitioned into the next phase, which was focused on plan development, the Steering Committee decided to reorganize the issue-specific working groups into six cross-cutting groups in order to address the challenges facing the School in a more comprehensive and integrated way. All members of the original issue groups were invited to join one of the new working groups, thus maintaining the representation of the faculty, students, alumni and administrators in the process. The membership lists for the adjusted working groups can be found in the “Working Groups Membership” section of this website. How will the strategic plan be used? The strategic plan puts forth areas of strategic priority for The Fletcher School for the next five years through four main objectives supported by specific action items which capture the recommendations of the strategic planning working groups. The recommendations will help advance Fletcher in its mission to educate professionals and prepare them for positions of leadership; to increase understanding of international issues through teaching, research and publication; and to serve local, national and international communities. The recommendations were informed by the current situation at Fletcher, the competitive landscape, and trends in higher education and the international affairs field. Implementation will begin immediately following the February 17 public launch. The process commenced in mid-January 2014 and concluded in December 2014. During the first phase, which ran until mid-March 2014, the working groups identified areas to be addressed in the strategic planning process. The second phase, from April to August 2014, concluded with the Working Groups submitting preliminary conclusions and recommendations to the Steering Committee. A drafting committee was appointed to draft and refine the plan from early September until the beginning of December 2014. A detailed draft outline, which served as the basis for the plan, was made available for review and comment from the Fletcher community in early November 2014. The plan was written by the drafting committee and adopted by consensus of the faculty in December 2014. Did students, alumni and other members of the Fletcher community have input into this effort? Students, alumni and the wider Fletcher community were vital to the process. We accepted comments via the feedback form on this website. Members of the Fletcher community were also invited to attend the strategic planning town hall meetings, which were streamed online for those unable to attend in person. Questions and suggestions for the town hall meetings were taken from the global Fletcher community via the feedback form on this site. How does the Fletcher strategic plan fit in with the Tufts T10 plan? The Tufts T10 plan addresses issues that cut across the entire university, including Tufts undergraduate programs and other graduate schools. Fletcher’ strategic plan focuses specifically on issues impacting The Fletcher School and professional preparation for the international affairs field. At the same time the themes articulated in T10 are appropriate to Fletcher and consistent with Fletcher’s mission and goals.